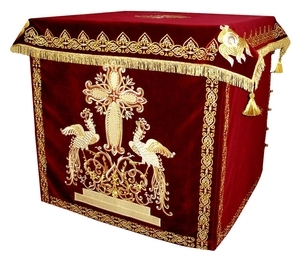 Holy table vestments - 1 (red-gold) - Istok Church Supplies Corp. Excellent holy table cover (embroidered shroud) designed by ancient XIII century ornaments on the church of Protection of the Most Holy Theotokos on the river Nerl', natural German velvet, embroidery. Price shown is for 55"x55" (140x140 cm). If different, please indicate your sizing in the Note field of your order. Please note that picture for this product is a sample one. If you would like specific fabric (in the same fabric class as this product) to be used for your order, please review Fabrics section and make a note in the Notes field of your order (at the last order placing page) which fabric you prefer.